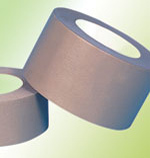 Flatback tape is coated with a high performance rubber adhesive. Hand tearable Flatback tape makes packing quick. No dispenser needed. Colors available call for info.